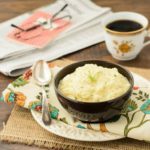 A recipe for pastina with egg, a quick and easy hot breakfast meal made with pastina pasta and flavored with parmesan cheese and fresh tarragon. Cook the pastina in a small saucepan according to the package instructions. Drain pasta. While the pasta is cooking, beat together the egg, parmesan cheese, 1/4 cup milk, and tarragon. While the pasta is draining, melt the butter in the saucepan over medium heat. Pour in the egg mixture while stirring constantly. Cook for 1 to 2 minutes until the cheese begins to melt (the egg will cook in the process). Stir in additional warm milk if desired for a creamier consistency.